Nights of Cabiria (Italian: Le notti di Cabiria) is a 1957 Italian drama film directed by Federico Fellini and starring Giulietta Masina, François Périer, and Amedeo Nazzari. 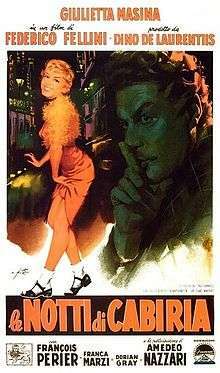 Based on a story by Fellini, the film is about a prostitute in Rome who searches for true love in vain. The film won the 1957 Academy Award for Best Foreign Language Film. This was the second straight year Italy and Fellini won this Academy Award, having won for 1956's La Strada, which also starred Giulietta Masina. A happy, laughing Cabiria (Giulietta Masina) is standing on a river bank with her current boyfriend and live-in lover, Giorgio (Franco Fabrizi). Suddenly he pushes her into the river and steals her purse which is full of money. She cannot swim and nearly drowns, but is rescued by a group of young boys and revived at the last possible moment by helpful ordinary people who live a little further down the river. In spite of just saving her life, she treats them with disdain and starts looking for Giorgio. Cabiria returns to her small home, but Giorgio has disappeared. She is bitter, and when her best friend and neighbor, Wanda (Franca Marzi) tries to help her get over him, Cabiria shoos her away and remains disgruntled. She continues to ply her trade as a prostitute. One night, she is outside a fancy nightclub and witnesses a fight between famous movie star, Alberto Lazzari (Amedeo Nazzari) and his girlfriend, as she dumps him. The differences in appearance between the glamorous girlfriend, in a mink coat, and the disheveled and short Cabiria are stark. The jilted Lazzari takes the starstruck Cabiria to another club and then to his house, where Cabiria is astounded by its opulence. As the two are finally becoming closer after a rather standoffish few hours, Lazzari's girlfriend returns and Cabiria is shuffled off to the bathroom, unable to consummate with the movie star. Later, a church procession passes the hangout area for the town prostitutes. As her associates mock the Church, Cabiria is drawn to the procession. Just as she is about to join the procession, another john comes and she gets in his truck instead. As she heads home later that night, she sees a man giving food to the poor people living in caves near her house. She has never seen this man before, but she is impressed by his charity toward others. When she goes to church with her friends, she prays for a chance to better her life. Cabiria goes to a magic show, and the magician (Aldo Silvani) drags her up on stage and hypnotizes her. As the audience laughs, she acts out her desires to be married and live a happy life. Furious at having been taken advantage of for the audience's amusement, she leaves in a huff. Outside the theater, a man named Oscar (François Périer) is waiting outside to talk to her. He was in the audience, and he says he agrees with her that it was not right for everyone to laugh, but believes that fate has brought them together. They go for a drink, and at first she is cautious and suspicious, but after several meetings she falls passionately in love with him; they are to be married after only a few weeks. Cabiria is delighted and sells her home and takes out all her money from the bank. After they are married, she offers to give Oscar 700,000 lira cash, but he declines. However, during a walk in a wooded area, on a cliff overlooking a lake, Oscar becomes distant and starts acting nervous. Cabiria realizes that just like her earlier lover, Oscar intends to push her over the cliff and steal her money. She throws her purse at his feet, sobbing in convulsions on the ground as he takes the money and abandons her. She later picks herself up and stumbles out of the wood in tears. In the film's famous last sequence, Cabiria walks the long road back to town when she is met by a group of young people riding scooters, playing music, and dancing. They happily form an impromptu parade around her until she begins to smile through her tears. The name Cabiria is borrowed from the 1914 Italian film Cabiria, while the character of Cabiria herself is taken from a brief scene in Fellini's earlier film, The White Sheik. It was Masina's performance in that earlier film that inspired Fellini to make this film. But no one in Italy was willing to finance a film which featured prostitutes as heroines. Finally, Dino de Laurentiis agreed to put up the money. Fellini based some of the characters on a real prostitute whom he had met while filming Il Bidone. For authenticity, he had Pier Paolo Pasolini, known for his familiarity with Rome's criminal underworld, help with the dialogue. Nights of Cabiria was filmed in many areas around Italy, including Acilia, Castel Gandolfo, Cinecittà, Santuario della Madonna del Divino Amore, and the Tiber River. At the time of the film's first American release, New York Times critic Bosley Crowther gave the film a mixed review: "Like La Strada and several other of the post-war Italian neo-realistic films, this one is aimed more surely toward the development of a theme than a plot. Its interest is not so much the conflicts that occur in the life of the heroine as the deep, underlying implications of human pathos that the pattern of her life shows...But there are two weaknesses in Cabiria. It has a sordid atmosphere and there is something elusive and insufficient about the character of the heroine. Her get-up is weird and illogical for the milieu in which she lives and her farcical mannerisms clash with the ugly realism of the theme." Forty years later, the Times carried a new review by Crowther's successor, Janet Maslin. She called the film "a cinematic masterpiece", and added that the final shot of Cabiria is worth more than "all the fire-breathing blockbusters Hollywood has to offer." Film critic Roger Ebert reviewed mainly the plot and Fellini's background: "Fellini's roots as a filmmaker are in the postwar Italian Neorealist movement (he worked for Rossellini on Rome, Open City in 1945), and his early films have a grittiness that is gradually replaced by the dazzling phantasms of the later ones. Nights of Cabiria is transitional; it points toward the visual freedom of La Dolce Vita while still remaining attentive to the real world of postwar Rome. The scene involving the good samaritan provides a framework to show people living in city caves and under bridges, but even more touching is the scene where Cabiria turns over the keys of her house to the large and desperately poor family that has purchased it." French director François Truffaut thought Cabiria was Fellini's best film to date upon its original 1957 release. In 1998, the film was re-released, newly restored and with a crucial 7-minute sequence that censors had cut after the premiere. The review aggregator Rotten Tomatoes reported that 97% of critics gave the film a positive review, based on 36 reviews. Cannes Film Festival: Best Actress, Giulietta Masina; OCIC Award - Special Mention, Federico Fellini; 1957. David di Donatello Awards, Italy: David, Best Director, Federico Fellini; Best Production, Dino De Laurentiis; 1957. San Sebastián International Film Festival: Zulueta Prize, Best Actress, Giulietta Masina; 1957. Italian National Syndicate of Film Journalists: Silver Ribbon, Best Actress, Giulietta Masina; Best Director, Federico Fellini; Best Producer, Dino De Laurentiis; Best Supporting Actress, Franca Marzi; 1958. Sant Jordi Awards, Barcelona, Spain: Sant Jordi, Best Foreign Actress, Giulietta Masina; Best Foreign Director, Federico Fellini; Best Foreign Film, Federico Fellini; Best Foreign Screenplay, Ennio Flaiano, Tullio Pinelli and Pier Paolo Pasolini; 1959. Cinema Writers Circle Awards, Spain: CEC Award, Best Foreign Film, Italy; 1959. The American musical Sweet Charity (and its respective film adaptation) is based on Fellini's screenplay. ↑ "NOTTI DI CABIRIA (AA)". British Board of Film Classification. 1957-10-22. Retrieved 2013-06-21. ↑ This and the following facts about the film's production are taken from a series of interviews with Fellini. ↑ "Locations for Nights of Cabiria". Internet Movie Database. Retrieved 29 April 2012. ↑ Crowther, Bosley. The New York Times, film review, 29 October 1957. Last accessed: 26 January 2008. ↑ Ebert, Roger. Chicago Sun-Times, film review, 16 August 1998. ↑ "Awards for Nights of Cabiria". Internet Movie Database. Retrieved 29 April 2012. ↑ Sweet Charity at the Internet Movie Database.